Emory’s Meet Me @ the Tunnel, six-week indoor walking group, kicks off Jan. 17. It’s just one of the fun, inexpensive activities on campus this month. 1. Get valuable tips on how to find and assess child care. “Selecting and Evaluating Quality Child Care” is a free workshop that will be held Wednesday, Jan. 10, from noon until 1:30 p.m. in the 1599 Building on Clifton Road. A representative from E4Health will guide you through your options and show you how to know what constitutes quality care. The seminar will also provide some creative options for when a first choice is not obtainable. The demand for child care in the Emory area is high and you can get this help for yourself or for a family member. Resources and programs available to help parents with issues of child care will also be also discussed. Drop in to the Woodruff P.E. Center any time between 10 a.m. and 2 p.m. on Thursday, Jan. 11, for the Healthy New You Expo. Experience free cooking demonstrations, fitness classes, meditation sessions, talks by wellness experts and exhibitors from the surrounding communities to help you in your goal to be healthier in 2018. There will be satellite sites at Emory Orthopaedic Hospital, Emory John's Creek Hospital, Emory Saint Joseph's Hospital and Emory University Hospital Midtown. 3. Attend a Zen meditation workshop. Join "Mindfulness on Impermanence" to see how Zen practice can improve your life. This free guided meditation and lecture will be conducted by three visiting Buddhist nuns from Taiwan on Thursday, Jan. 11, from 6 to 8 p.m. in the sanctuary of Cannon Chapel. This is a bilingual event in English/Chinese. 4. Cheer on the Eagles in the thick of basketball season. Emory’s men’s basketball team has a 10-2 record so far this season and started off 2018 with a win. There are four more home games to choose from in January. The women’s team is 6-6 with one of their wins an exciting overtime victory. They also play four more home games in January. All games are free and held at the Woodruff Physical Education Center gym. Parking is nearby and free in the Peavine parking deck. Visit Emory Athletics for the full schedule. 5. Improve your well-being by joining a six-week winter walking group. Head to the Emory University Hospital Tunnel beginning Wednesday, Jan. 17, at noon for the return of Meet Me @ the Tunnel, Emory’s indoor walking group. 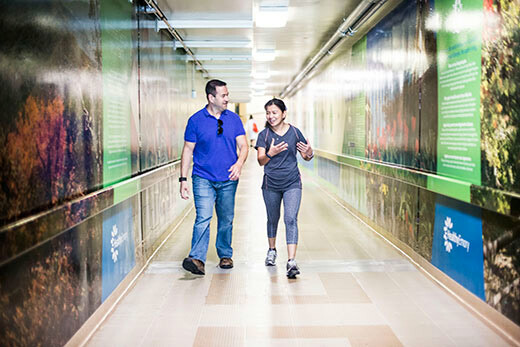 Each Wednesday through Feb. 21, walk for an hour with co-workers and others from across campus in the weather-sheltered tunnel that connects Emory University Hospital, Emory Clinics A, B & C, and the Emory Rehabilitation Hospital. 6. Examine “Bunk” with poet and professor Kevin Young. Join poet and Emory University Distinguished Professor Kevin Young for a reading from his latest nonfiction book, “Bunk: The Rise of Hoaxes, Humbug, Plagiarists, Phonies, Post-Facts, and Fake News.” This free and public reading will be held Jan. 18 at 4 p.m. in the Jones Room of the Woodruff Library, followed by a book signing. Young was curator of literary collections and of the Raymond Danowski Poetry Library at the Rose Library for nine years, is poetry editor of The New Yorker and director of the Schomburg Center for Research in Black Culture in Harlem. He is the author of 12 books of poetry and prose, including two nonfiction books, and editor of eight other collections. 7. Have afternoon tea and scones at AntiquiTEA. AntiquiTEA, a free monthly event at the Michael C. Carlos Museum, features tea and art history graduate students, staff and others talking about an object in the museum’s collection. On Thursday, Jan. 18, at 4 p.m., Emma de Jong, a graduate student in art history, discusses a costume in the museum's collection of African art, the gallery for which was recently renovated. The costume is from the Dan people who live in the western part of Côte d'Ivoire and eastern Liberia and are known for the wide variety of masks that are central to their cultural and social life. For the Dan a mask is more than just a face covering and this particular costume raises a number of questions. 8. Enjoy beautiful music in the middle of your day. Tchaikovsky’s Piano Trio will be performed by the Summit Trio, featuring pianist Robert Henry, violinist Helen Kim and cellist Charae Krueger, on Friday, Jan. 19, at noon. This concert is part of the Emory Chamber Music Society of Atlanta’s Cooke Noontime Series, a monthly series held in the Carlos Museum’s Ackerman Hall. 9. See two exhibits on campus due to end this month. “Unwritten Histories: Preserving Scrapbooks from the Collections” is on Level 2 of the Woodruff Library through Jan. 21. “To Care for Others: 100 Years of Nursing at Emory” is at the Woodruff Health Sciences Center Library at 1462 Clifton Road through Jan. 31. 10. Experience some of Atlanta’s best choruses. The Atlanta Community Choral Festival features Atlanta’s finest community choirs, hosted by the Atlanta Master Chorale. At the upper end of our price range at $10 per ticket, this annual concert is held this year on Saturday, Jan. 27, at 8 p.m. in Emerson Concert Hall of the Schwartz Center for Performing Arts.